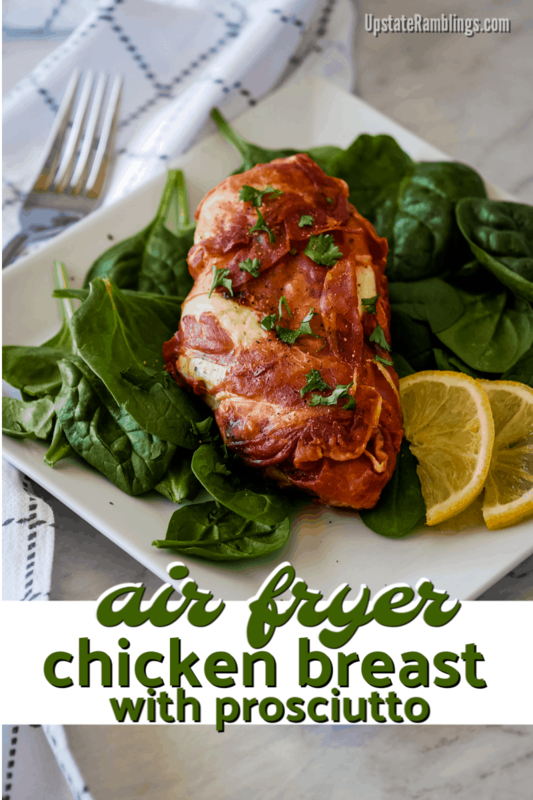 This easy air fryer chicken breast recipe is quick and easy to make with only 3 ingredients. 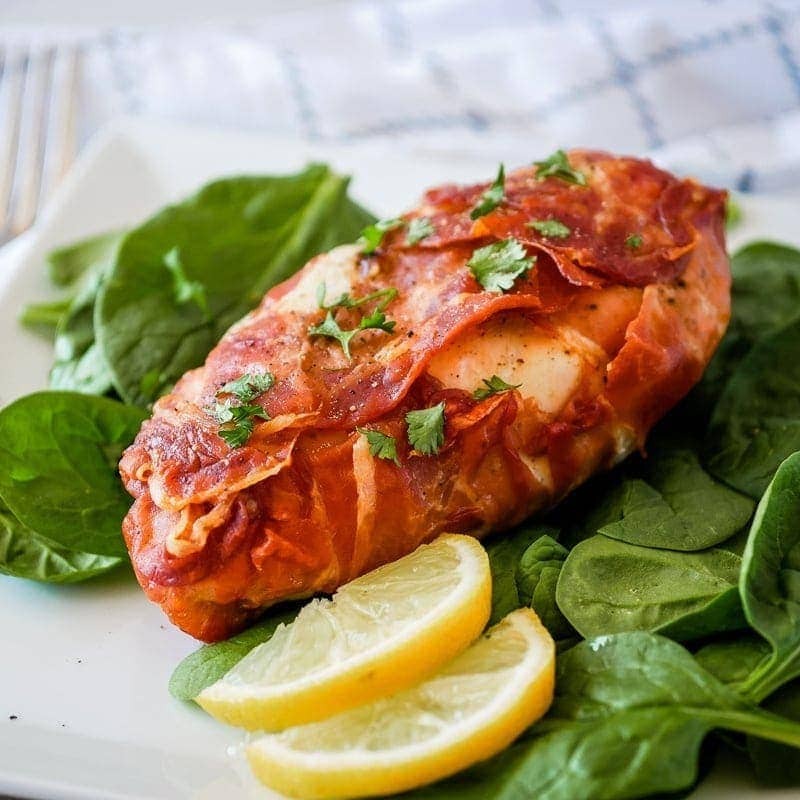 The chicken is wrapped with prosciutto resulting in a crispy prosciutto outer layer with juicy and tender chicken inside. You can have this tasty dinner on the table in about 30 minutes! When my husband bought me an air fryer for Christmas I wasn’t sure if it was a gift I would use. 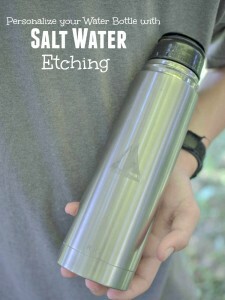 Now that I have been using it for a few months I am thrilled with it and I cook in it multiple times a week. 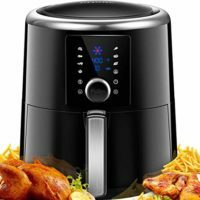 An air fryer is just a small convection oven which enables you to cook more quickly and with less fat. 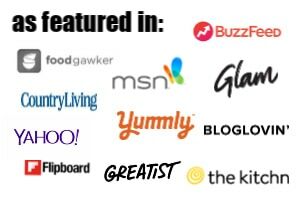 When I started looking for recipes for air fryer chicken I quickly realized most of these recipe included breading, which I rarely use. So I came up with this recipe for prosciutto wrapped chicken which is cooked quickly in the air fryer without any added fat. Once you taste this easy air fryer chicken recipe you will see why I have made it many times since I got my air fryer. The crispy prosciutto combines with the juicy chicken for a dish that is versatile and delicious. Additionally this recipe is perfect for many types of diets. 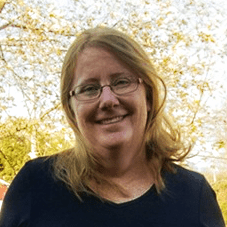 Since it has so few ingredients it is low carb, keto diet friendly, gluten free, dairy free, paleo and whole 30 compliant. 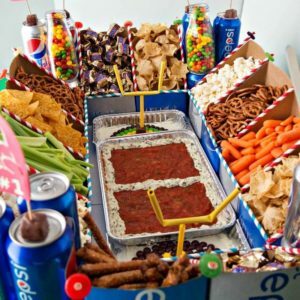 So if you are having friends over who have dietary restrictions you’ve got pretty much everyone covered with this dish, expect vegetarians and vegans. Chicken breast is an ideal meat for making in the air fryer, because the convection cooking keeps it moist inside. Chicken breast is easy to overcook, which results in stringy, dry meat. The convection oven cooks it quickly and in this recipe the prosciutto protects the delicate meat and prevents it from drying out. The prosciutto also adds extra fat to the meal which makes the chicken taste even better. You don’t need to add any fat or oil to this recipe as the prosciutto provides plenty as it cooks on the chicken breast. Prosciutto is an Italian ham which has cured by air drying. Prosciutto does not have to be cooked to be eaten, although when it is cooked it gets nice and crispy. 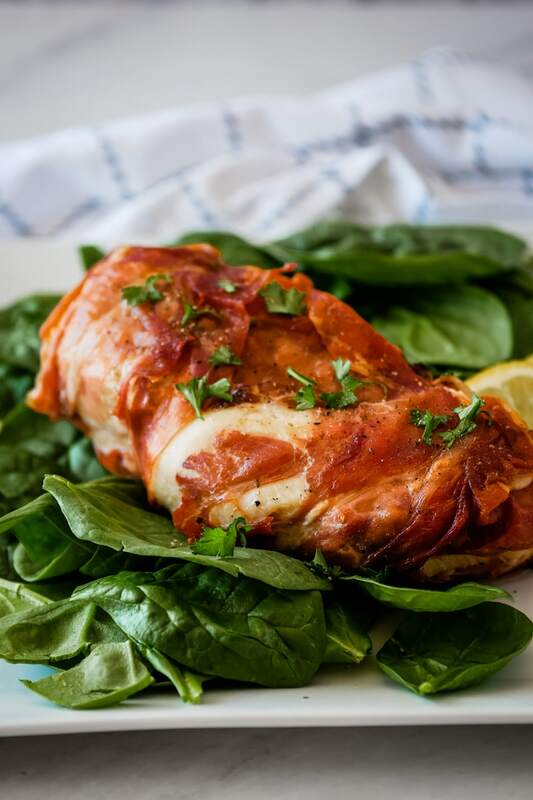 Chicken Saltimbocca is a traditional Italian dish in which chicken is combined with prosciutto and sage and cooked in butter. This recipe is a much simplified version of that fancy restaurant style dish. 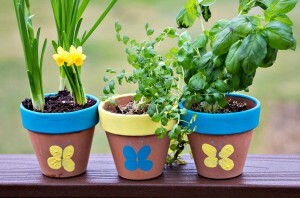 It has many of the same flavors, but it is much easier to make. It is quick enough to make on a weeknight, but also elegant enough to serve to company. I used boneless chicken breasts in this recipe. For my family a boneless breast is enough meat for two people, so three chicken breasts serves 5-6 people. 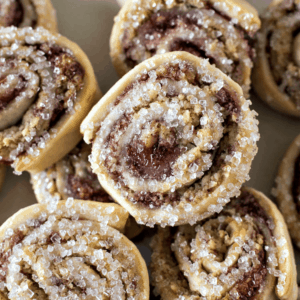 This recipe is super easy to make, which is one of the reasons I like it so much. To prepare the chicken I simply sprinkle each breast with salt, pepper and sage. Prosciutto is salty, so go lighter on the salt than you would if you were not wrapping the chicken. I think about 1/4 teaspoon of salt for each chicken breasts is plenty. 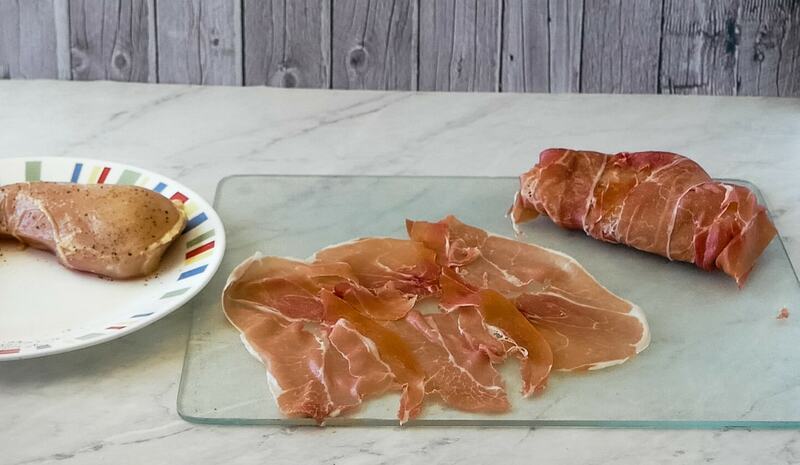 Then lay out 2-3 slices of prosciutto on a cutting board and place a chicken breast on top. Wrap the prosciutto around the chicken, covering most of the meat. Repeat with all the chicken and then place it in the air fryer basket and cook for 15 minutes. It is important to not crowd the chicken in the air fryer basket. 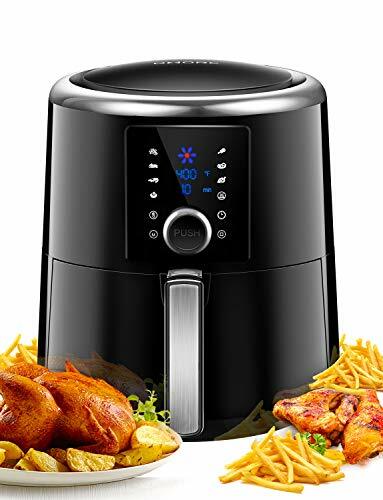 The air fryer cooks by circulating hot air around the food, so if you pack the food in so closely that the air can’t circulate it won’t work correctly. My air fryer, the Omorc XL 6 quart model, can fit 3 large chicken breasts or 4-5 smaller ones. It is also necessary to turn the chicken half way through the cooking time. The top part of the meat will brown up more than the bottom part, so flipping keeps the browning even and ensures that all sides of the chicken are nice and crispy. 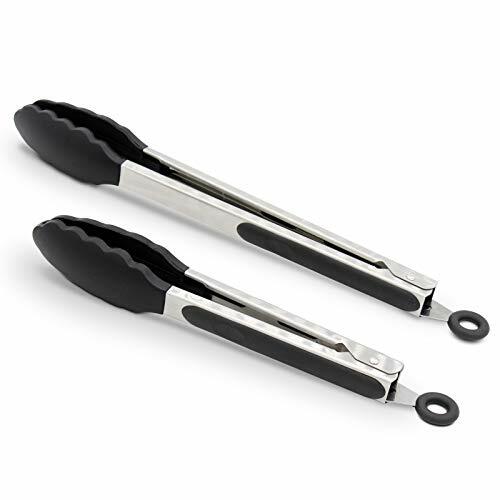 It takes only a few seconds to pull the air fryer basket out and flip the chicken with tongs. Once the cooking time is up I always test the meat with an instant read meat thermometer. 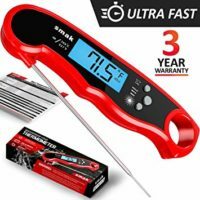 Once I started consistently using a meat thermometer in my cooking the consistency and quality of the food I was serving improved immensely! Air fryers vary in size and cooking speed and chicken breasts can vary quite a bit in size. So don’t guess, use a meat thermometer and check the temperature. Chicken breast should reach about 165 F to be safe to eat. The chicken will continue to rise by about 5 degrees while it rests so it is safe to take it out once it reaches 160 F.
If the chicken isn’t quite up to temperature after 15 minutes put it back in the air fryer for another 3-6 minutes, depending on how far off from 160 F it is. After cooking is finished it is a good idea to let the chicken rest on a plate for about 5 minutes. This makes it juicier because some of the liquid that was released by cooking is reabsorbed into the meat. Then you can slice and serve. Can I use Chicken Cutlets in this Recipe? A boneless chicken breast is an uncut chicken breast which has been skinned and boned. A chicken cutlets (or fillet) is a slice which has been cut from the breast meat. Chicken cutlets are thinner and more uniform in size. 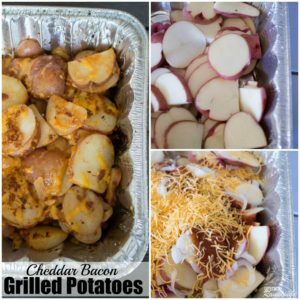 They would work fine in this recipe although you’d need to decrease the cooking time. I’d suggest starting with 10 minutes for chicken cutlets and then checking the internal temperature with a meat thermometer. For this recipe I don’t see a lot of benefit to using chicken cutlets though, unless it is just a matter of using what you have on hand. Cutlets are better for sauteing because they cook more evenly, but that isn’t an issue with this air fryer chicken recipe. You can fit more chicken in the air fryer basket with the thicker chicken breasts and chicken breasts are usually cheaper than chicken cutlets. Can you use Frozen Chicken in this Recipe? You can cook frozen chicken in an air fryer. I probably wouldn’t use this recipe for it though. It seems to me that the prosciutto wouldn’t stick as well to the frozen chicken breasts. I’d also worry that the extra cooking time needed would be too much for the prosciutto. So I’d suggest sticking to fresh or thawed chicken for this dish. 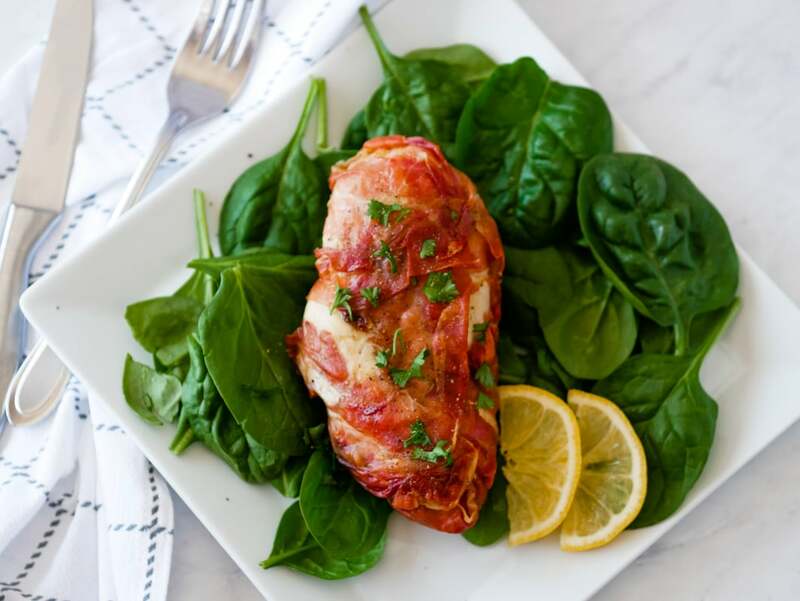 This prosciutto wrapped chicken recipe is also great for meal prep. You can cook up the chicken breasts on a Sunday evening and enjoy them later in the week with vegetables or a salad. I have used leftovers from this meal to make chicken tacos – and the prosciutto made the tacos extra tasty. You can also heat the meat back up in the air fryer. Just put the air fryer on 350 and pop the chicken breast back in for 6 minutes or so and you can eat your leftovers hot. 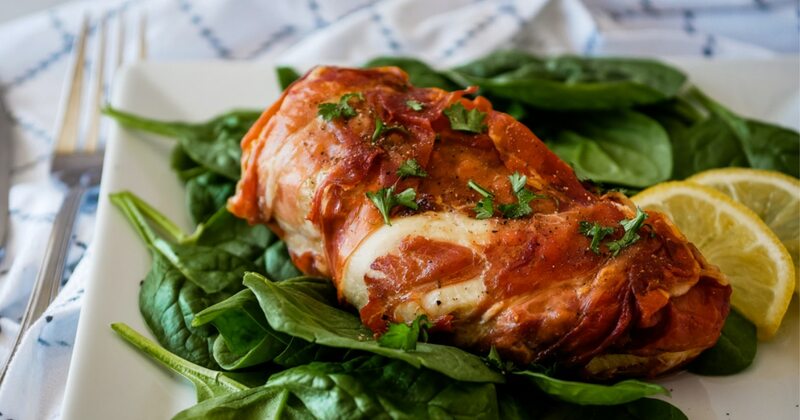 What Should I serve with Prosciutto Wrapped Chicken? I usually serve this chicken with a couple of quick sides, like rice, sauted green beans and a quick green salad. If you want to go all out with Italian inspired dishes it would taste amazing served with Utica Greens. 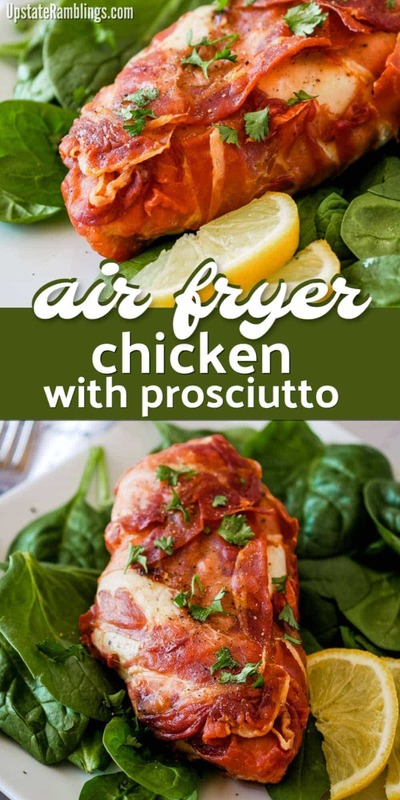 Chicken is wrapped with prosciutto and cooked in the air fryer resulting in a crispy prosciutto outer layer with juicy and tender chicken inside. Put the boneless chicken breasts on a cutting board and sprinkle with sage, salt and pepper. Keep in mind the prosciutto is salty, so go easy on the salt. I think 1/4 t. per chicken breast is plenty. Wrap each breast with 2-3 slices of prosciutto, so that the prosciutto covers most of the chicken. Cook in the air fryer at 400F for 15 minutes, turning once. 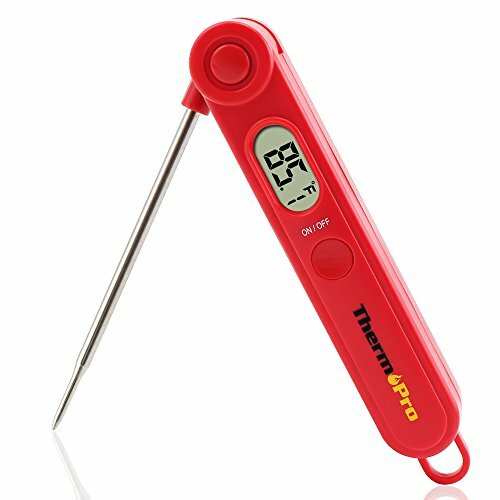 Check the temperature of the chicken with an instant read thermometer. If it is 160 F or above take the chicken out. Otherwise return it to the air fryer for another 2-6 minutes, depending on how close it is to done. Let the chicken rest for five minutes. You could place a whole fresh sage leaf on the chicken instead of dried sage to make it more like Chicken Saltimbocca. If you use smaller and thinner chicken breast cutlets reduce the cooking time to 10 minutes before checking the internal temperature.